You might be under the impression that school attended online is similar to attending a traditional brick and mortar school. The truth is, there are differences. The quality of the educational materials presented is the same, but there are a few traits that make it easier for students to be successful at a virtual school. There are a few qualities that ensure the road to academic success is in your future. What are they? When attending school online, you are your own time-keeper. You must be diligent in keeping track of how long you are spending on each assignment. It’s best to come up with a schedule that fits your needs and find a way to adhere to it. Perhaps you can set a timer at set intervals to help you stay on track. You’ll need to stay up-to-date on assignments and make sure you check your student email frequently for new information. Certain applications and programs that are used frequently should be readily understood and utilized. Students who are willing to learning new programs will have a higher likelihood of succeeding in an online learning environment. There are a lot of things happening at once and there isn’t going to be anyone to remind you to complete the tasks at hand, so keeping yourself organized is key to your success. Keep a separate online folder for each subject with clear notes on homework assignments and project due dates. Being able to find what you’re looking for quickly reduces time searching and increases time learning. 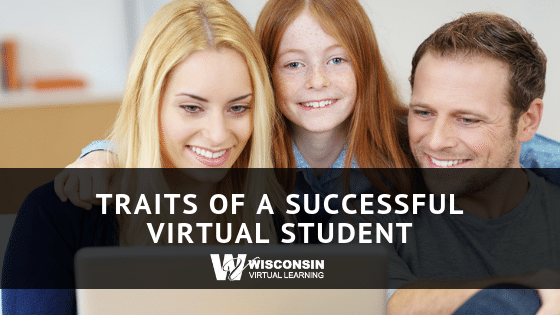 At Wisconsin Virtual Learning we do provide an extra layer of support with our Student Learning Advocates, but students who are organized see the best success. Virtual school in Wisconsin is becoming more and more popular. If it’s something you’ve considered, Wisconsin Virtual Learning offers online tuition-free education. Click HERE to request information.